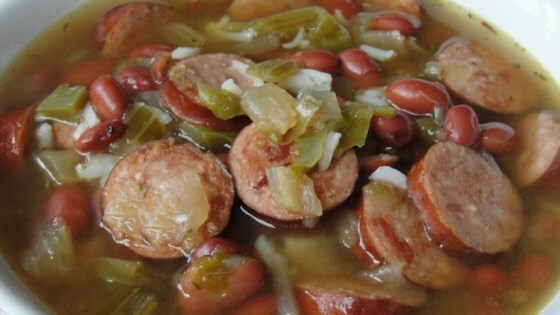 "If you love the flavors of red beans and rice, combine the ingredients to make a filling and healthy soup!" Combine water, sausage, kidney beans, onion, celery, chicken bouillon, Cajun seasoning, garlic salt, and thyme in a slow cooker. Cook on High for 4 hours. Add rice and cook until rice is tender, about 1 hour more. Not a big fan of this one. I found it rather bland. Will not make again.